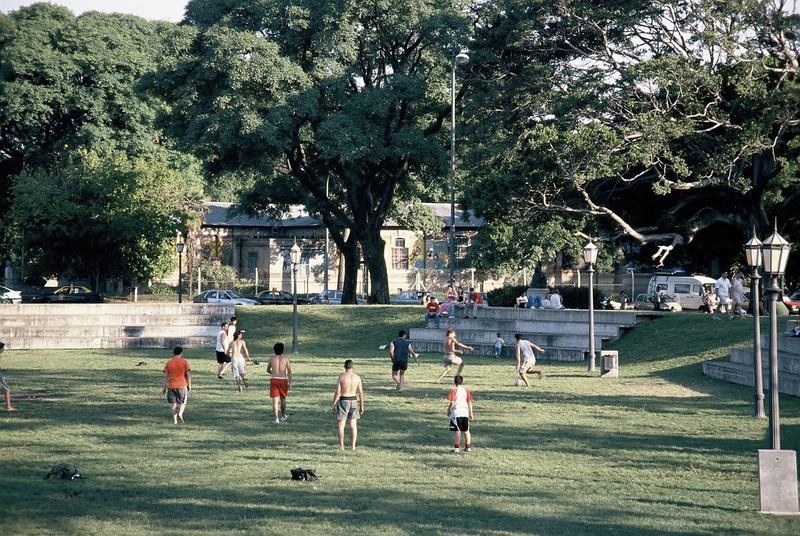 In a Eurocentric travel industry, South America often gets short shrift. It’s quite a distance for most Northern Hemisphere visitors, airfares are relatively high, and the continent’s stereotyped reputation for crime and disorder is a deterrent for some—even though, at present, Venezuela is the only real basket case in that regard. 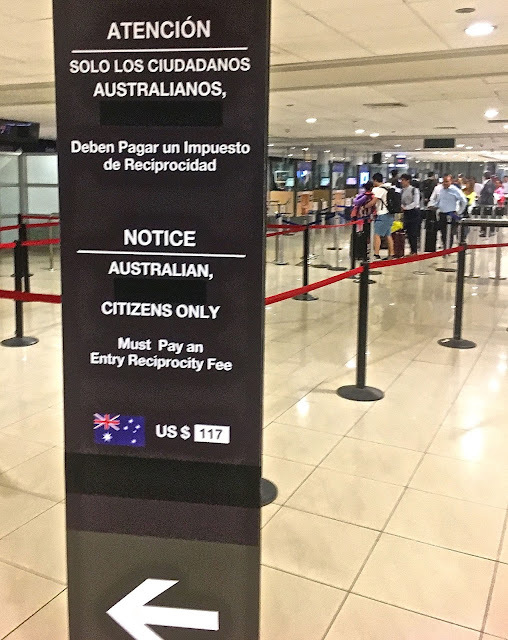 On arrival at Santiago's international airport, Australians may feel singled out. That said, some countries have also made it harder for themselves because of arbitrary visa rules, but there are fewer holdouts now. Argentina has eliminated the onerous “reciprocity fee” instituted by its previous government and Chile’s similar measure now applies only to Australians—as Aussie arrivals to Santiago’s international airport quickly learn (Chile does not inflict this fee at other airports and land borders, however). 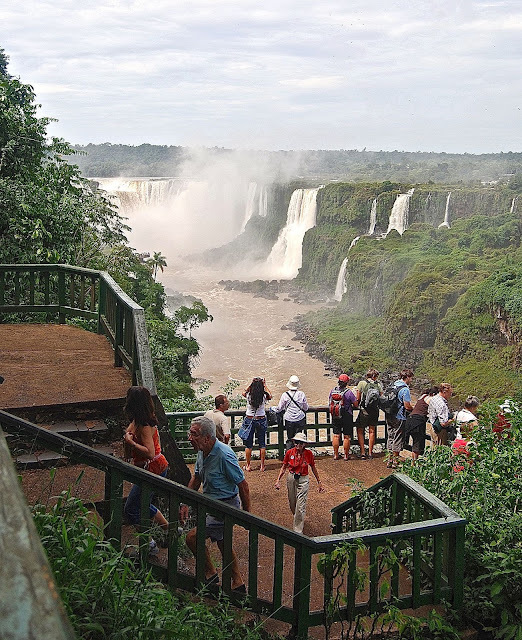 Visiting the Cataratas do Iguaçu (the Brazilian side) has become less expensive for several nationalities. The big news, though, is the breakthrough in Brazil. Every time I’ve visited the country—only infrequently—entering has been a hassle. That’s because Brazil has taken the “reciprocity” issue a step farther, requiring an advance visa from US citizens even for a day trip from the Argentine side of Iguazú Falls. 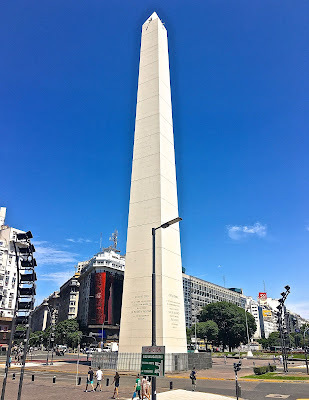 The last time I did it, the Brazilian consulate in Buenos Aires told me to get the visa in Puerto Iguazú, where that consulate required me to change my US cash into Argentine pesos (in a local exchange house, at a disadvantageous rate). The worst is over, though. Last month, the country announced that citizens of Australia, Canada, Japan and the United States may now apply for their visas online, at a cost of US$40, rather than in person or by mail at a cost of US$160. The idea, apparently, is to encourage tourism and, if so, it’s a good start—but even better would be eliminating visas entirely. That said, the United States will probably continue to require Brazilians to pay that same US$160 fee simply for a privilege of applying for a visa, with no guarantee (and no refund if no visa is granted). Still, it’s an encouraging measure on Brazil’s part (Brazil, by the way, will return your fee if it refuses you a visa). Bolivia is now the outlier. Following the example of Argentina’s previous government, it instituted a visa requirement that requires any US citizen to pay US$160 at any Bolivian consulate (that’s even more restrictive than Venezuela, despite that country’s notoriously contentious relations with the US). Again, in fairness, Bolivians must go through the same process to enter the United States, with no guarantee that the request will be successful. 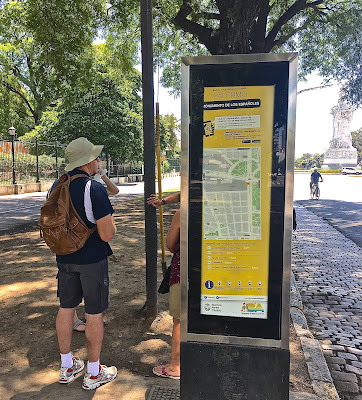 These days, whenever I’m in Buenos Aires, I prefer to get around on foot—while it’s more time-consuming than the Subte, city buses or taxis (all of which I use on occasion), walking offers the opportunity to view the city at a slower pace and also provides some exercise that can be otherwise hard to find on the unrelentingly flat terrain. During my recently stay, I walked as much as 11 miles (about 17 km) per day, though most of the time I did half that or a bit less. 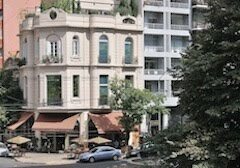 At some point soon, I’m planning to write about Buenos Aires specifically as a walker’s city—both the good and the bad. 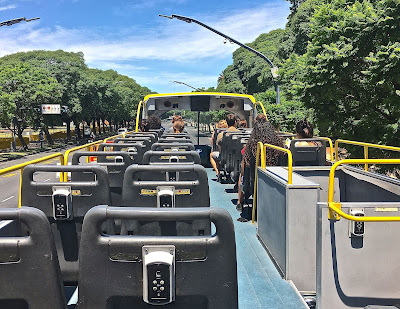 I rarely take tours but, shortly before leaving Argentina earlier this month, I chose to see the city through two services I’d not known personally—Buenos Aires Bus and Biking Buenos Aires. 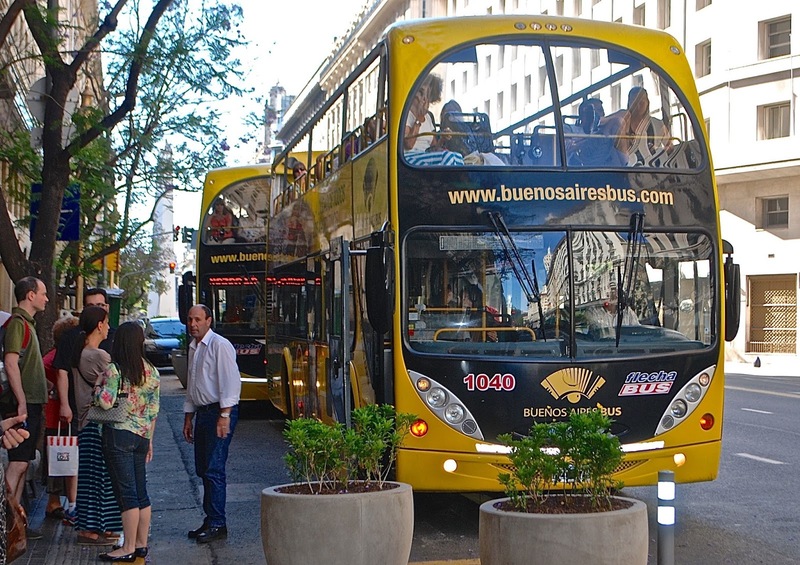 Buenos Aires Bus is a hop-on/hop-off tourist shuttle that runs two separate routes around the city, between 9 a.m. and 9 p.m. (though the northerly recorrido verde operates only between 10 a.m. and 6:50 p.m. Frequencies are 20 minutes on the central and southerly recorrido azul/rojo and 30 minutes on the verde. 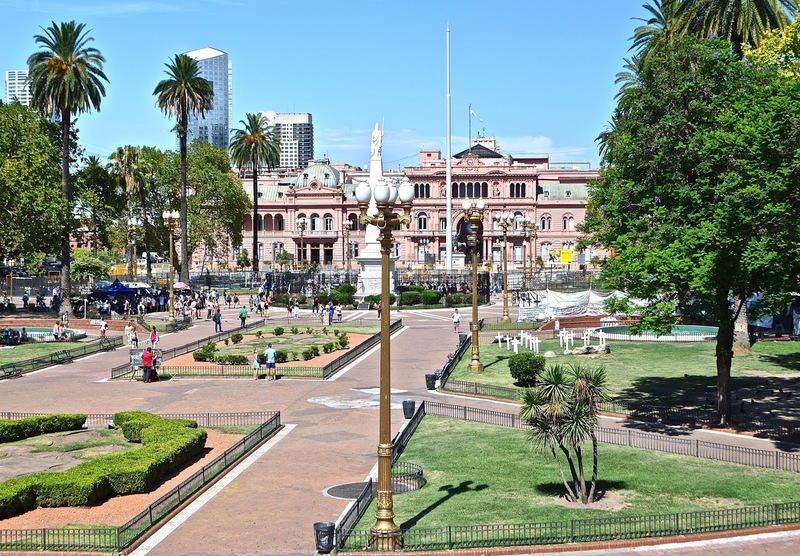 While the company has its offices downtown, a short walk from the central Plaza de Mayo, it has convenient stops throughout the most visited parts of the city, and it’s possible to purchase tickets online and board near your accommodations. 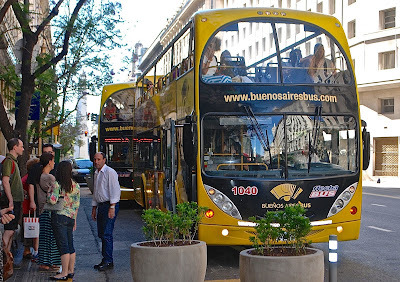 In my case, there’s a stop just a couple blocks from my Palermo Botánico apartment, where I boarded for the ride downtown. The buses themselves are double-deckers, sometimes open to the sun and sometimes shaded by a tarp; the lower deck is available when it rains. There are trilingual guides on board—Spanish, English and Portuguese—but there are also audio guides in seven other languages, including German, French, Italian, Chinese, Japanese, Hebrew and Arabic. Every passenger receives a pair of headphones to hear the narration. Sitting in the upper deck, I got a view of the city that was rather different from that of a pedestrian and I only regret that, as the end of my stay approached, I was not able to take full advantage of the service. 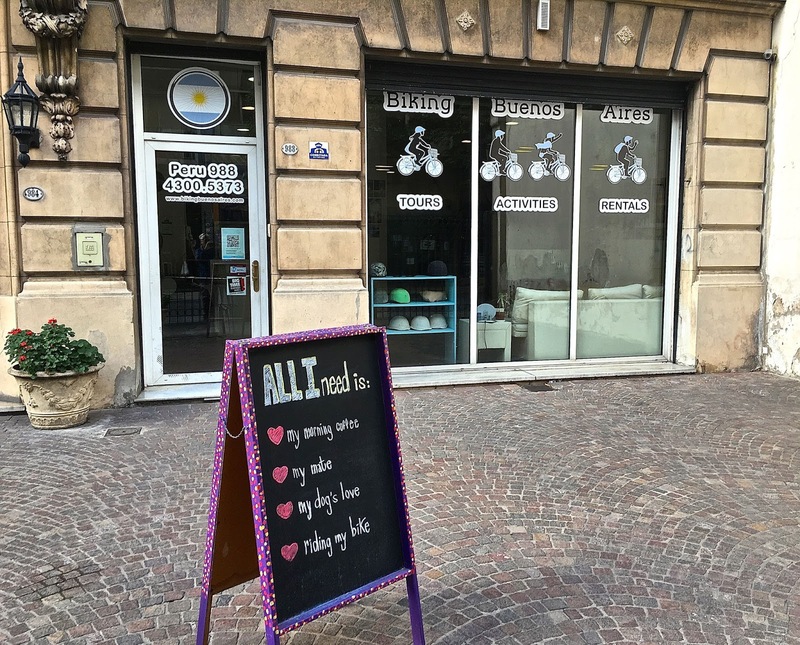 For a first-time visitor to the city, though, it’s an option worth consideration, available either for 24 hours at Ar$670 (about US$34) or 48 hours at Ar$850 (about US$43) per person. On another day, though, I was able to indulge myself on a bicycle tour through parts of the city I’ve long known. 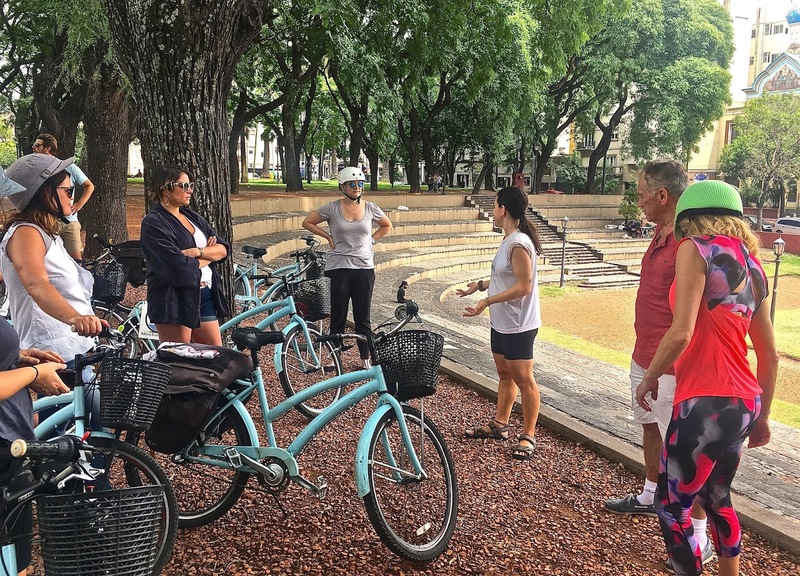 Based in San Telmo, Biking Buenos Aires offers a variety of excursions, ranging from a five-hour “Heart of the City Tour” to a seven-hour “Ultimate City Tour” and thematic tours on architecture, urban art (including graffiti) and even a combined bike and kayak trip to the northern suburbs. 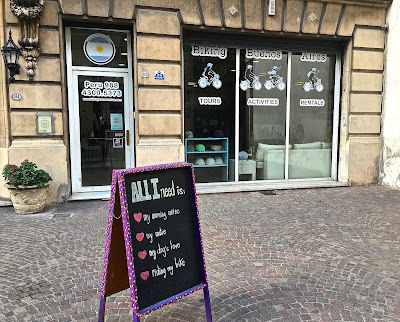 In the last week of my stay, I chose the “Heart of the City” option, which started around 11 a.m. with an orientation meeting, at Biking’s offices, for the eight of us (all Americans except for an English-speaking French couple). Our guides were Cristina Marey, a Galician woman who headed the group, and Olaf Menger, a Dutchman who brought up the rear and directed traffic at intersections where notoriously aggressive porteño drivers might plow into us. 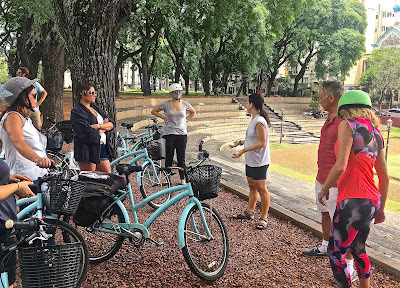 Our first stop was Parque Lezama, only a few minutes from Biking’s offices, where Cristina spoke about the city’s supposed founding here by Pedro de Mendoza in 1536, and pointed out local landmarks such as the Iglesia Ortodoxa Rusa. 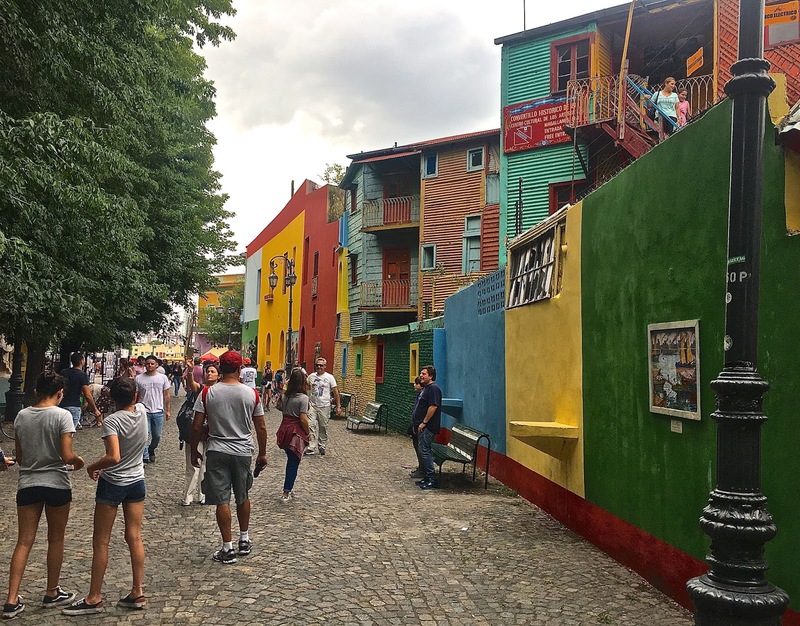 We then rode on to La Boca for a stop at the traditional Caminito, where I was a reluctant recruit for a tango lesson with Olaf—I have two left feet and no sense of rhythm (at tango’s beginning, men danced with each other in brothels while waiting for a prostitute). 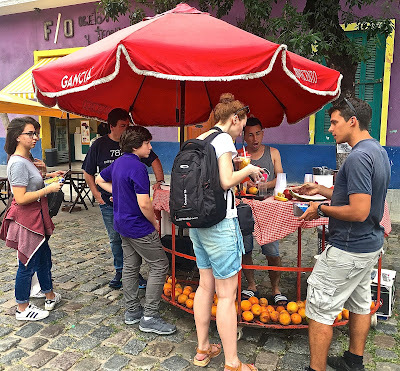 The Caminito is an obligatory stop in La Boca. 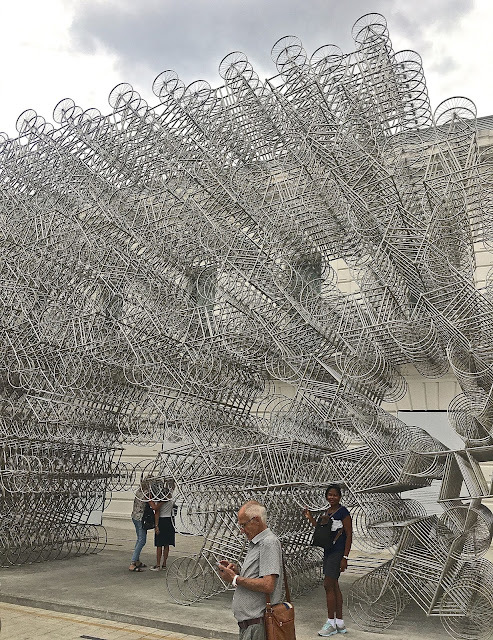 Until April, Ai Weiwei's "Forever Bicycles" will occupy the sidewalk outside the Fundación Proa. 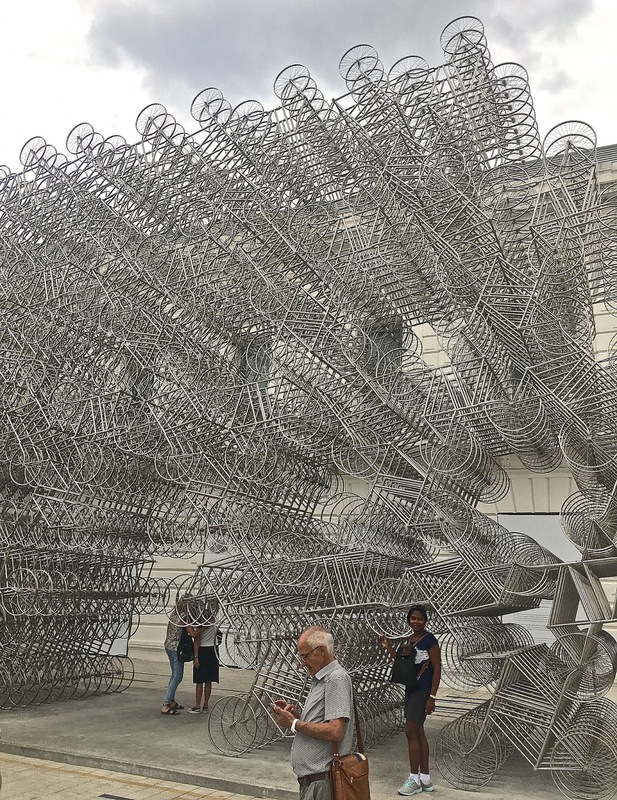 The lesson was mercifully brief, followed by a short walk around the Caminito, where I saw two interesting novelties: first, at the Fundación Proa, a bicycle-oriented art installation by Ai Weiwei (here until early April), and then a fresh-squeezed orange-juice cart. Increasing in numbers, the orange juice carts are a welcome phenomenon in the city’s summer heat, are increasing in numbers. 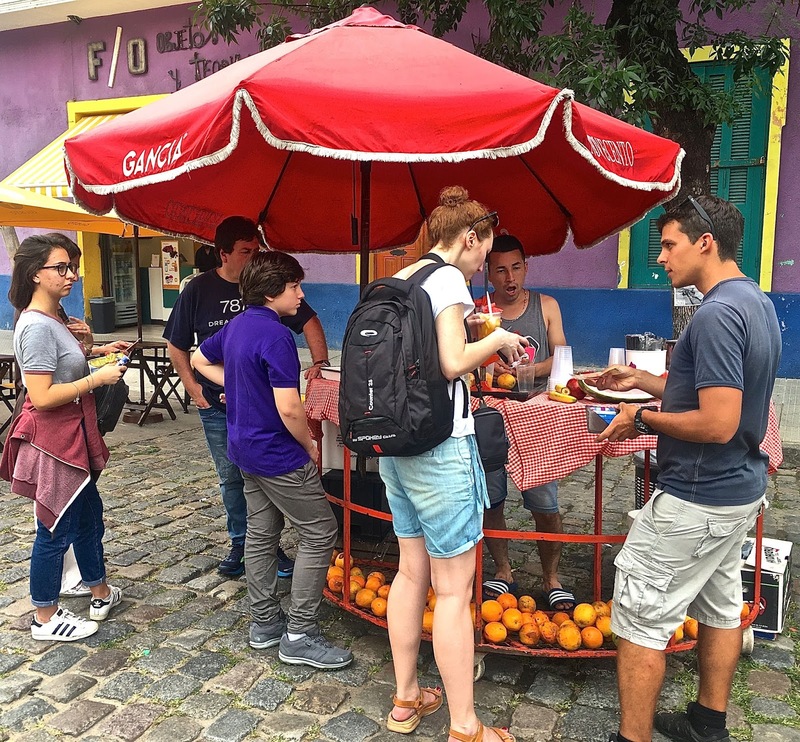 Fresh-squeezed orange juice carts are an increasingly common sight on the city's streets. Local boy Carlos Tévez is a hero in La Boca. 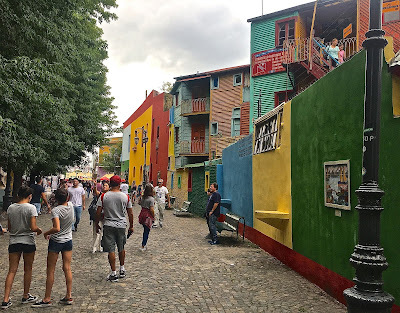 I heard, in the orientation, that we would see murals in La Boca, but I anticipated the historic paintings on the walls of La Bombonera, Boca Juniors’ iconic soccer stadium. 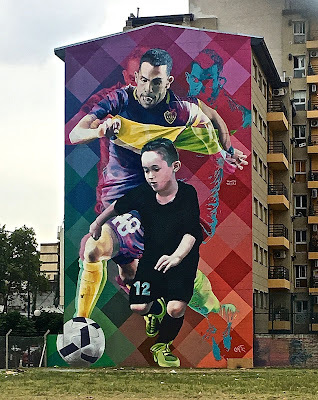 Instead, we proceeded to a part of the barrio I didn’t know, where newly painted murals, such as this one of barrio hero Carlos Tévez—who recently re-signed with his original team—cover the sides of high-rise apartments. La Bombonera is visible in the distance, but in the other direction. Puerto Madero's Reserva Ecológica is a reclaimed landfill. Also atop the reclaimed landfill are luxury apartment buildings. 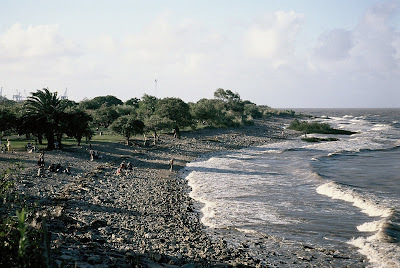 From La Boca, we rode toward the shores of the Río de la Plata and the Reserva Ecológica Costanera Sur, where grasses, shrubs, woodlands and birds have colonized a landfill that was once off-limits. It’s part of the city’s newest barrio, Puerto Madero, which is also the wealthiest but, not so far in the future, its luxury high-rises might require canoe or kayak access as rising seas also raise the river’s level in an already flood-prone zone. 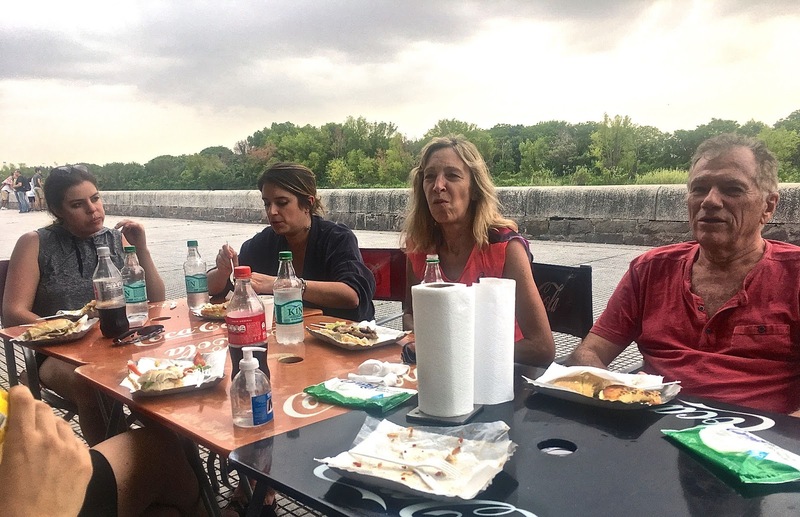 Biking's clients lunch at Puerto Madero, with the Reserva Ecológica in the background. Emerging from the woods, we lunched at a sandwich stand before continuing to the classic diques (basins) of the old port, now surrounded by the city’s priciest real estate, and the landmark Puente de la Mujer pedestrian bridge. 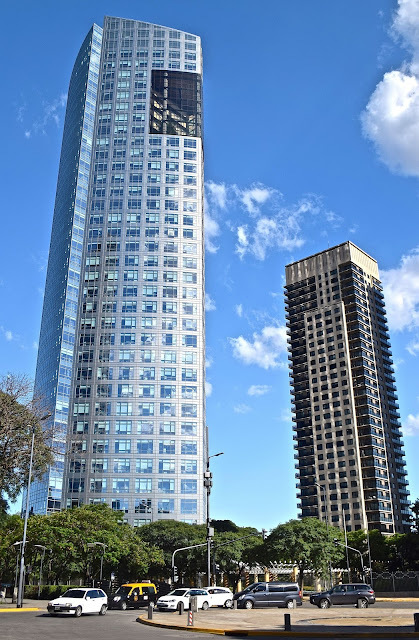 Cristina commented that Puerto Madero is unaffordable for all but the wealthiest porteños, and that’s certainly true, but as Andrew Graham-Yooll once remarked to me, its ample public spaces—not limited to the Reserva Ecológica—are open to visitors of all social classes. Spanish architect Antonio Calatrava's Puente de la Mujer has become an icon of Puerto Madero. 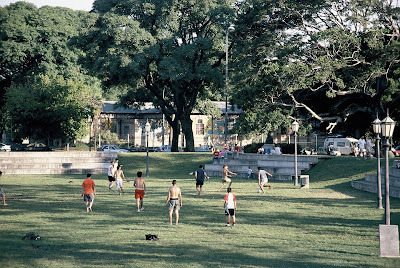 Puerto Madero's public areas are open to all, for activities like pickup soccer games. 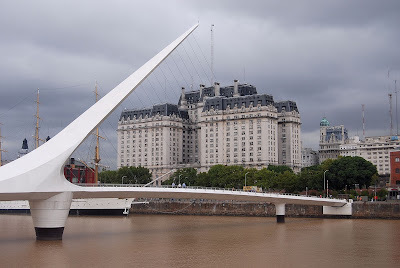 Leaving Puerto Madero, we had our only uphill segment—a short one, but still a bit of an effort on a relatively heavy bike—before reaching the central Plaza de Mayo and its landmark buildings. Unfortunately, the Plaza itself is undergoing a major remodel (at the height of tourist season! ), so we soon looped back to Biking’s offices and the conclusion of a satisfying 17-km two-wheel trip. 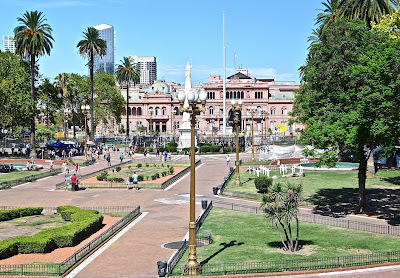 Shortly after I took this photo, from the balcony of the colonial Cabildo, the Plaza de Mayo closed for a major remodel.